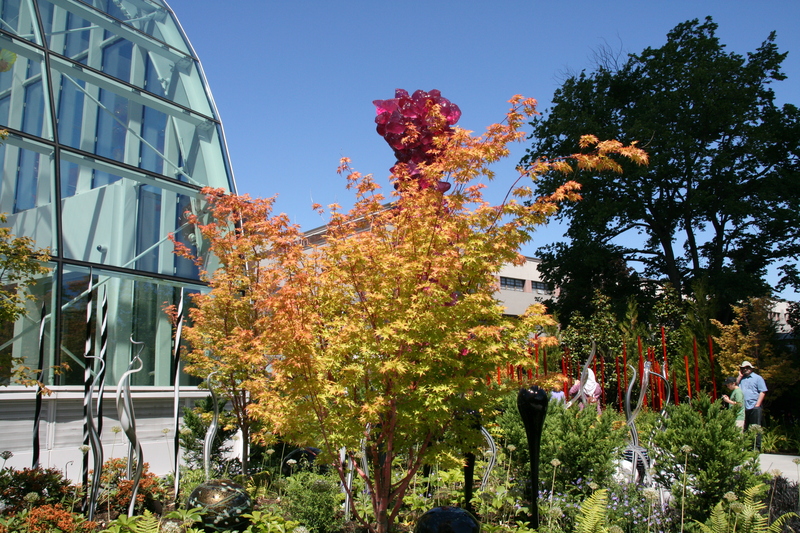 In the heart of Seattle WA, right next to the iconic Space Needle, exists the innovative Chihuly Garden and Glass. 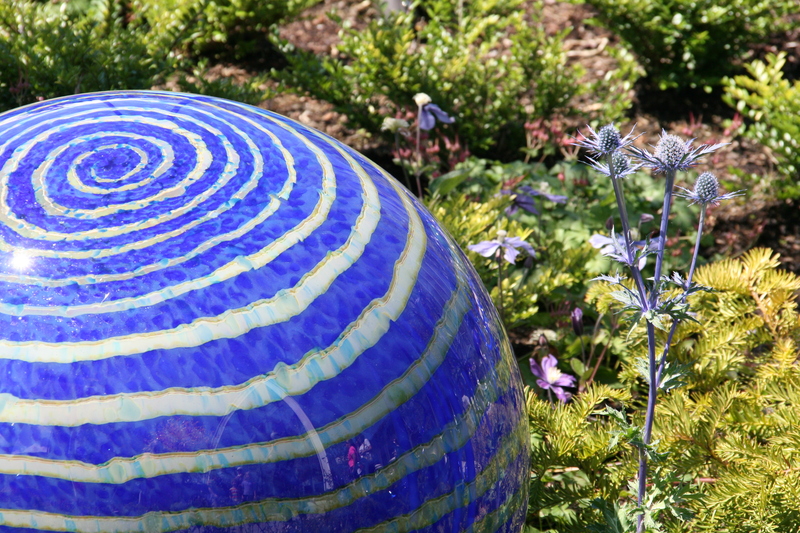 It is named for its creator, Dale Chihuly, the American glass sculptor considered to be the world premier glass artist. 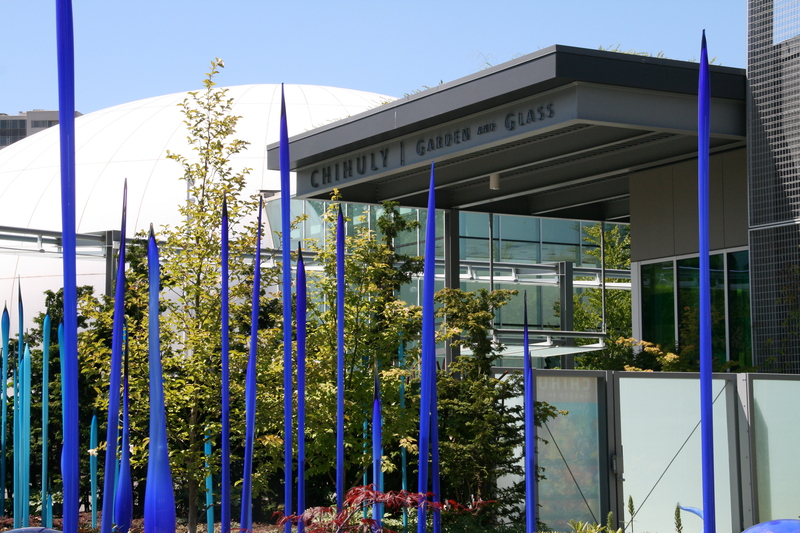 Chihuly himself has had a lifelong love of conservatories and has wanted to create a glass house for over 30 years. The 2012 reinvigoration of Seattle center allowed him to build his dream when the city approached him to create a project on a 1.5-acre plot. His Seattle glass house is inspired by two of his favorites buildings – London’s Crystal Palace (no longer extant) and Sainte Chappelle in Paris. 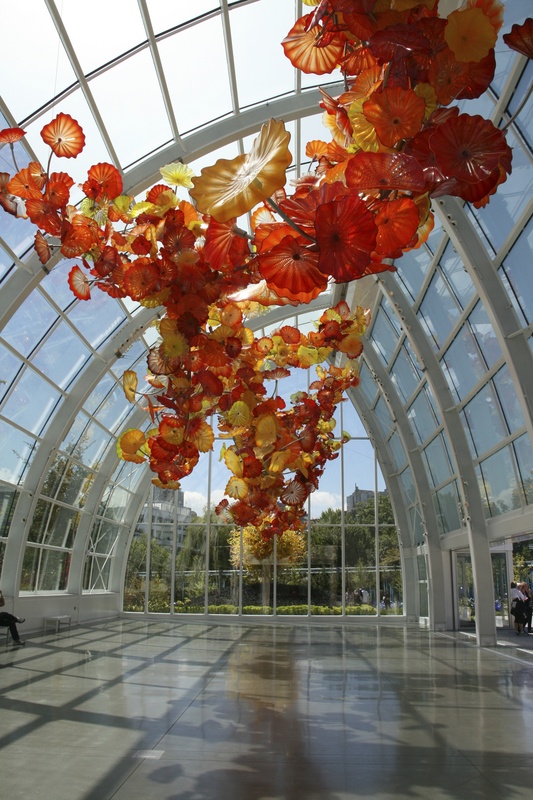 These sources of inspiration are apparent in the scale of the glass house as it towers at 40 feet tall, covers 4500 square feet of space and houses one of Chihuly’s largest and most ambition work of art to date. Despite the fact there are no new concepts in the garden – it consists of a glass house, plants and garden sculptures – the combination of these age-old garden denizens gathered together with new vision creates a clever 21st century garden. The glass house is more cathedral than common, and the fact that the garden sculptures are glass works by the master himself elevates them from the fate of being humble garden statuary to fine art. Amidst the splendor of the glass house and sculptures one might almost think that the plants are irrelevant but that is not at all the case. 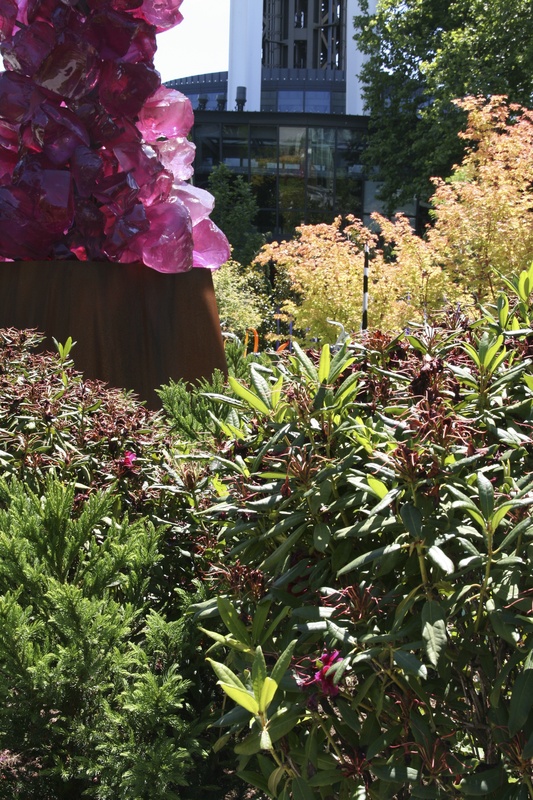 The plants are the perfect backdrops for showcasing the sculptures, and the sculptures offset the plants to perfection. I love this garden. To enter the garden one walks through dark exhibition halls, into the voluminous glass house and then out into the garden itself. The progression from dark halls to glass house to outside garden, consciously or not, increases the awe of standing in such a spacious glass house under Chihuly’s magnificent, intensely colored sculpture. One is dwarfed by all that glass, and then exits out into the very human scale garden. I think it would have been a lot of fun to be the landscape designer for this project but that fun went to AHBL Landscape Architecture. They didn’t choose rare or exotic plants or a complicated planting plan for the garden. There is nothing exceptional, or even exciting, among the plants. There are Japanese maples, dogwood, magnolia, laurels, roses, viburnum, geranium, hellebores, asters, daylilies, sedums, daffodils and grasses – everything and nothing you wouldn’t find in a serious gardener’s garden. Yet the appeal of the garden is strong and it comes from its simplicity of design, its color harmony, its proximity to the glass house, and, of course, the presence of the glass sculptures. Like every successful garden, each season brings different delights. I had just missed the rhododendrons in bloom, but did catch how even their fading flowers reflected the color of the sculpture. 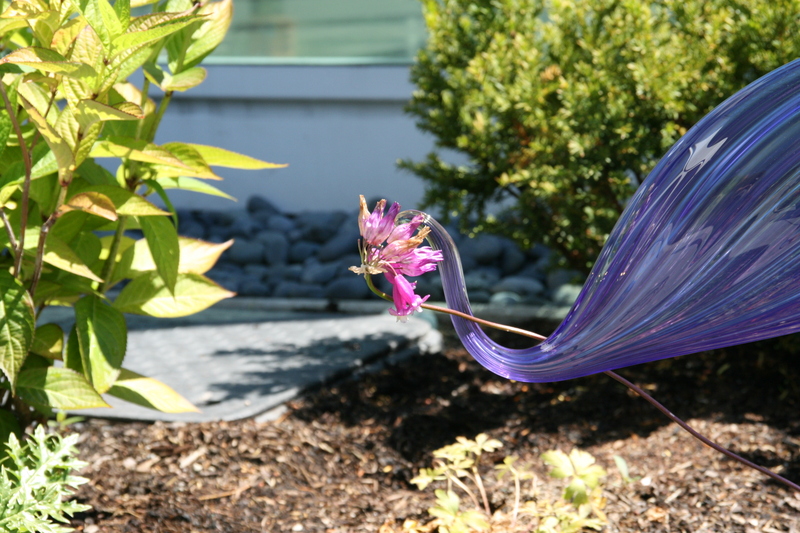 I can’t decide if it is a good thing or a bad thing that I live in a climate that won’t permit a Chihuly glass sculpture in my garden. It is perhaps a good thing because I could never afford one, but it is oh too bad that I am not able to have at least one. I loved the glass house more than any other Chihuly exhibit I had been to. I was transposed and transfixed by the beauty and grace. Thanks for highlighting his work. I too love the glass house, such vision. 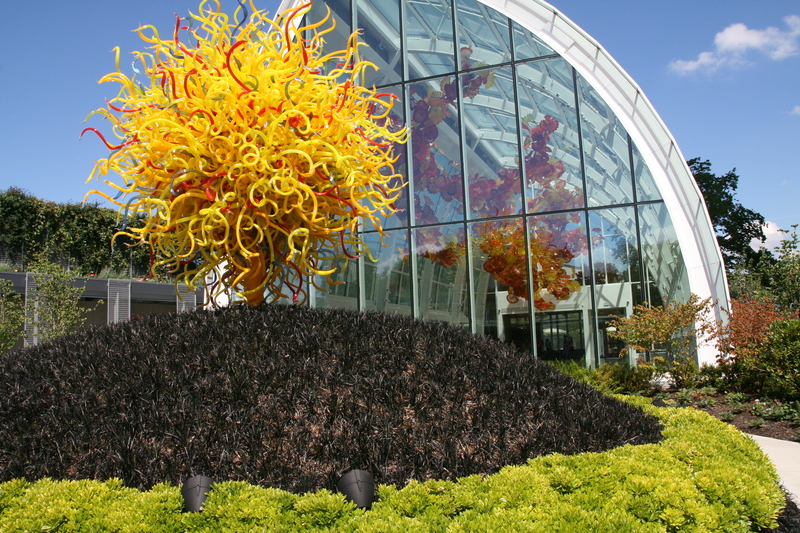 With Chihuly’s work it’s tough for me to chose a favorite, but the glass house is right at the top of the list. The plants do look like perfect backdrops for the sculptures. I was recently at the DeCordova Sculpture Museum and had the same thought. What would the sculptures look like without the landscape? Not nearly as impressive I thought. But this takes it to a whole other level. I love it when landscapes are interactively inspiring and not just passive scenery. Beautiful pics! Thanks Brianna, you have said it so well “I love when landscapes are interactively inspiring and not just passive scenery” I heartedly agree. Glad you like my photos – I like taking them and sharing them. The huge red and yellow flowers look magnificent in the otherwise empty glass house. I wish they had not placed that yellow-red, squiggly, tree-shaped piece just outside the end of it. It looks like it’s competing for attention. Interesting observation. 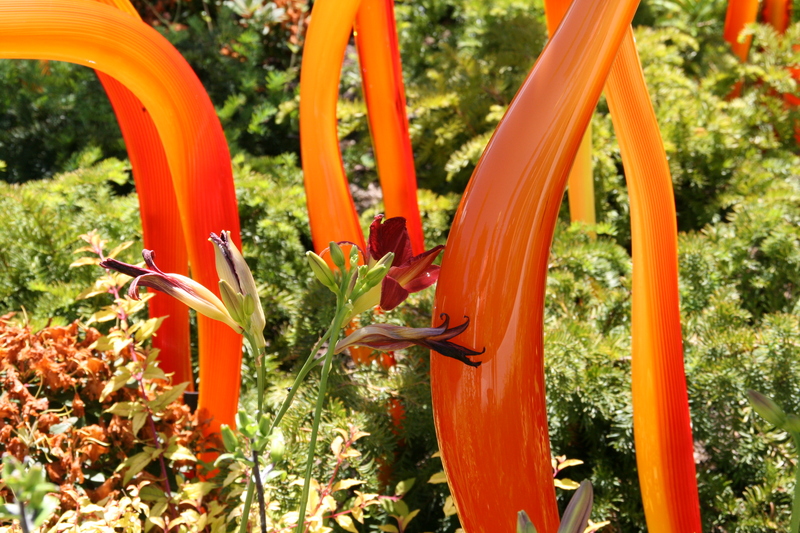 I have to say I didn’t notice the outside yellow squiggly sculpture when I was in the glasshouse. It is meant to be a major statement piece outside, and it is. 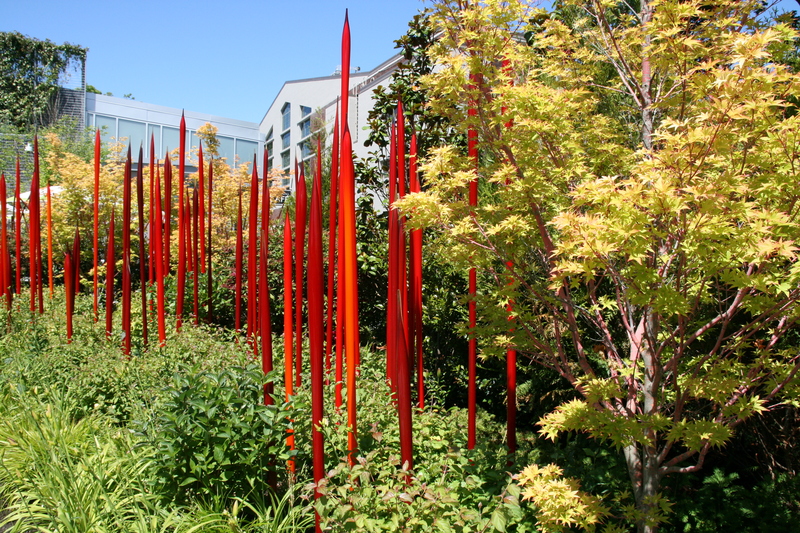 I hope you get to visit Chihuly Garden and Glass for yourself sometime soon. Wow, so much intense color! I love the way the glass accentuates the colors of the plants. Thanks for taking us along on your visit. Yes, I agree, the colors are amazing. It is such an innovative garden. I’m glad you came along on the visit. Very interesting and amazing images! I only heard about Chihuli art glass, I hope one day to see it in reality. I hope you get to see it one day soon. His glasswork is an amazing visual delight. Your descriptions and photos are beautiful. 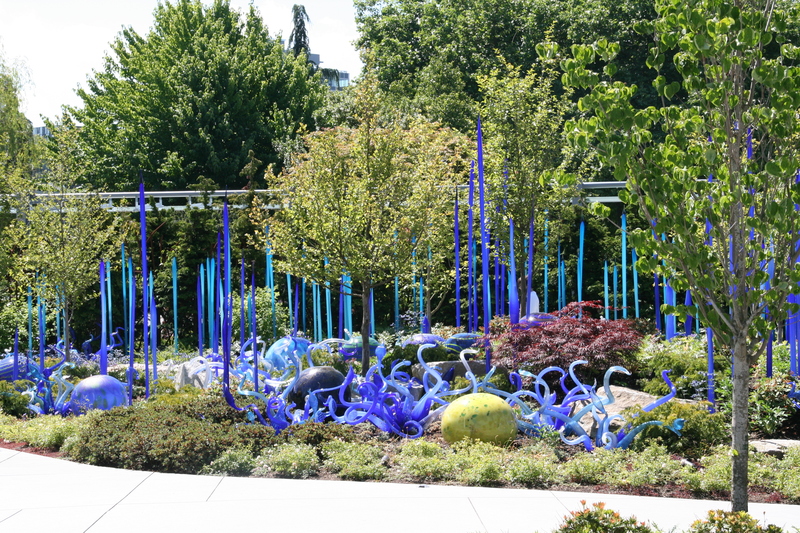 I love using glass in the garden, even in very simple ways, but Chihuly’s work, especially as conceived and assembled here, is something very special. Thanks for sharing. Thanks for your comment. I am happy for you that you are able to use glass in your garden climate. 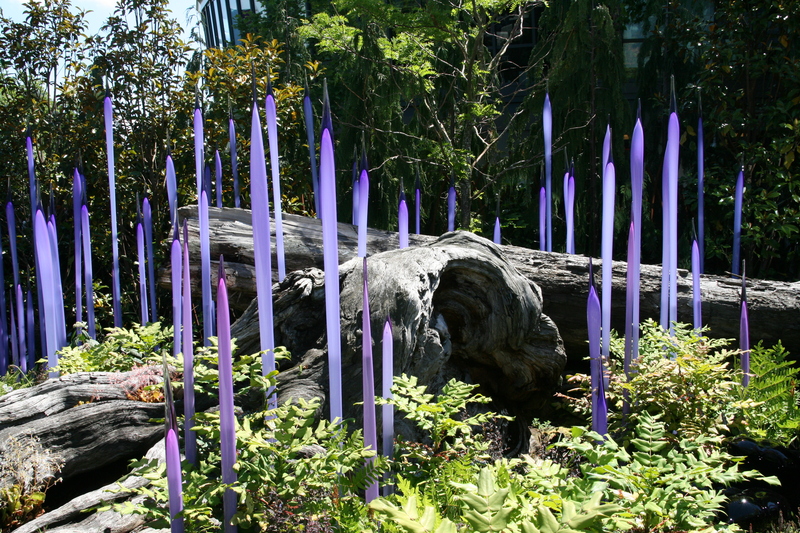 And I agree that Chihuly’s work is very special.